Bernie Sanders is probably the only Democrat who has been honest enough to admit that the Democratic Party has been a complete failure. It’s focus on Marxism and creating class warfare has been a serious issue that will fuel civil unrest as the Socialist agenda continues to implode. Sanders recently said: “The business model, if you like, of the Democratic Party for the last 15 years or so has been a failure. 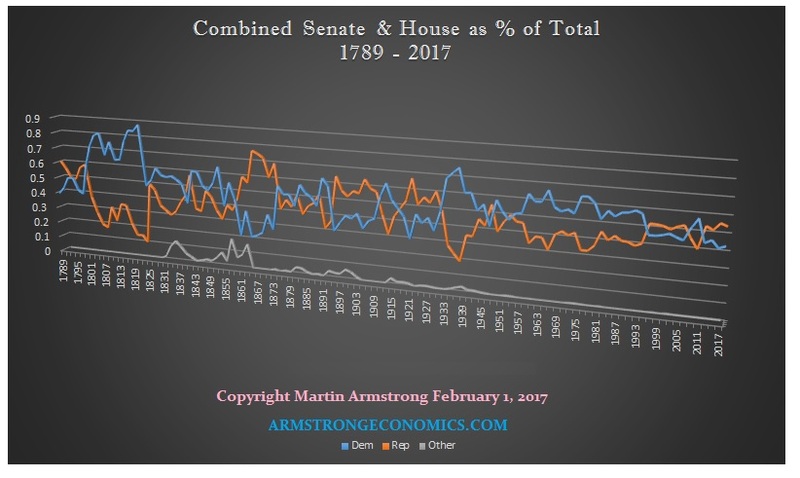 People sometimes don’t see that because there was a charismatic individual named Barack Obama.” When we look at the total seats held in both the Senate and House by each party, the bear market in the Democrats becomes obvious. 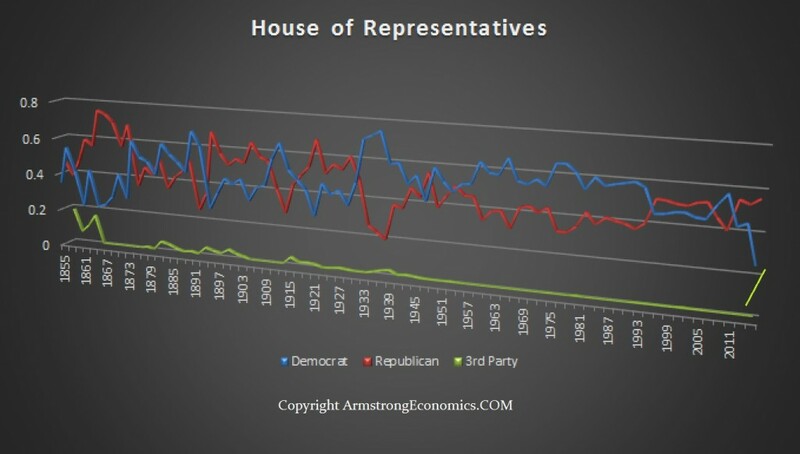 The Democrats actually peaked with the first election of Franklin D. Roosevelt in 1932. They have been gradually declining ever since. Bernie pointed also to the Democratic Party’s many state legislative losses to Republicans. He has pointed out that the Republicans control most of the state legislatures throughout the country. What Bernie fails to grasp is that government is far too corrupt to actually govern and provide any true improvement in the lifestyle of the average person. The entire Socialist agenda has been devastating on absolutely every front. The introduction of Social Security shifted the focus away from inter-family security being replaced by the state. Kids no longer save to take care of their parents for that is the government’s job. Eastern Europeans still rely upon the family as you also see in China. In the USA, an amazing amount of children are still living with their parents into the 30s all because of taxes. 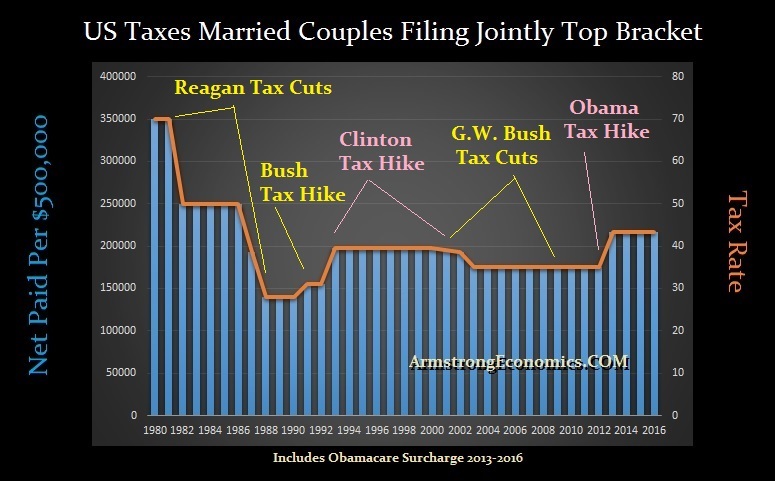 On top of that, the tax burden upon people has steadily risen. During the 1930s, it took just one person to earn a salary to support a family. It was the Democrats who imposed the income tax all the way down creating the Payroll Tax. 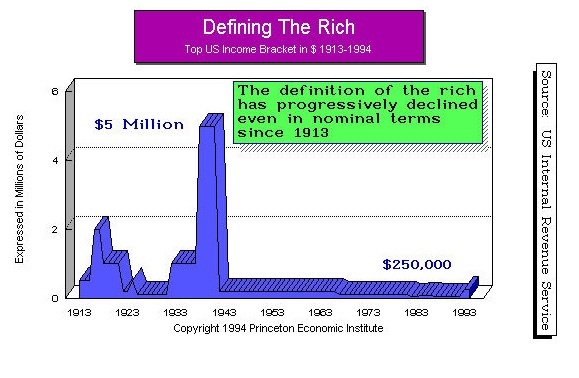 They changed the definition of the rich from $5 million to $250,000 just to collect more taxes. What they have done is not just caused more children to be living with their parents into their thirties, but young families cannot survive unless the wife also works. That may be great for the Women’s Liberation Movement, but it has also robbed women of even the luxury to stay home and raise their children during the formative years. It now takes two incomes to sustain what one used to do before the income tax. The Democrats also seriously altered the black family, which was once stronger than even the white community because they needed each other. With the introduction of welfare, they began to pay girls for the number of children they had and created an incentive not to get married. Similar programs in New Zealand provided total care for a girl if she had no idea who the father of the child was. Even the white community found the number of women who had no idea who the father was rose dramatically because they received free housing. The guy just ran out the back door when the social worker arrived. The ethnic background or race does not matter – it is economic incentives to undermine the family structure. Today, the black family has fallen to the bottom compared to whites and Hispanics all because of decades of economic incentives not to have a family structure. Studies now show the net effect of such social policies. “The United States shows striking racial and ethnic differences in marriage patterns. Compared to both white and Hispanic women, black women marry later in life, are less likely to marry at all, and have higher rates of marital instability.” Instead of blaming race, we need to look closer at the failure of Socialism. The only message of the Democrats is also the same – vote for them because you are the victim of the rich. Instead of being like King Midas where everything he touched turned to gold, everything they have touched has crumbled to dust. Have Democratic policies ever worked? Communism failed. Behind the old Iron Curtain, the people as a whole learned the hard way that government is not something you can trust. Unfortunately, Europe and North America must learn the same lesson. The first major reform is not to simply lower taxes, but to prohibit direct taxation as was originally set forth by the Founding Fathers until the Marxists amended the Constitution and have ever since been destroy our culture. One of the primary reasons corporation have moved offshore is not because they will pay wages that are cheaper. The number one reason is for consistency. It is always a battle over taxes. How can you invest in a plant and assume your profit margin will be XYZ, and then the Democrats raise the taxes when they get back in. Other countries office 25-year tax guarantees NOT to raise their tax rate. Would you sign a lease for an apartment that said if the landlord needs money, he can raise your rate any time he desires and if you refuse to pay he can throw you in prison? Welcome to the American tax system.